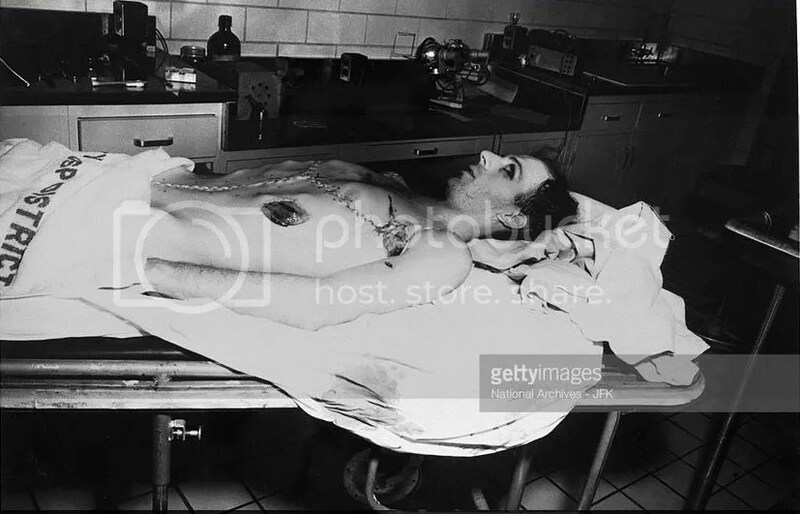 Please be warned before going beneath the fold on this post that I am including graphic photos of President Kennedy supposedly taken after his shooting on November 22, 1963. I do so because I know the photos to be fake, but if you are among those who think the events of that weekend were real, then the photos will shock you. These photos were first released, as far as I know, with the book Best Evidence by David S. Lifton in 1981. I believed for many years that his work was the best ever done on the assassination. He followed down leads, interviewed participants, chased caskets, and ultimately concluded that Kennedy’s body had been surgically altered between Dallas and Bethesda. For that reason the autopsy doctors were led to the wrong conclusions about number and direction of bullets. It was misdirection, all of it. I cannot say whether Lifton knowingly misdirected us, or that he too was among the duped. In either case, the book can be ignored. Now, go below the fold. Be prepared. I accepted that conclusion at the time, and I accepted the paper as a breakthrough. I still do. It was a turning point for me, restoring my optimism and igniting a bout of curiosity that has not since subsided. I agree in total with the conclusions – the body is not Kennedy, the eyes should be closed and not watery … but I add one more aspect to it: The face is that of President Kennedy. However, it took me a long time to reach that conclusion. Below is another photo analyzed by this researcher in which he points out that John Connolly is in the wrong position and that Jackie is wearing different clothes. His point was that several takes were done of the motorcade (we have no idea when), and that the actors were often in different positions so that the photographic record is not bulletproof. A few weeks back I look at that photo again and thought “That’s not JFK! That’s the guy who was used for the morgue photos!” I then cropped the face and went looking for images of JFK in the same pose. After rigorous comparisons, I concluded that this is indeed JFK, and that it does indeed match the face on the morgue body all the way down to the missing eyebrow. My world had been upended again. I realized that the morgue body was JFK’s, and then naturally concluded that he really did die that day. Would it ever end? But I was premature in that conclusion. He is deep in thought as he answers a question at a press conference, and pointing to his right side, which indicates that he is about to tell a lie. But set that aside. It is the exact same angle as the morgue photo. Here they are, side by side. Notice how the alignment of the nose and chin and mouth and eyes all agree exactly. That is indeed President Kennedy’s face on the morgue photo. But take a closer look – see that the ears on the living JFK (the shadowy image) are out of line – too far away from the eye and too high on the head. If all other parts of the face align, then the ears should too, and they don’t. My conclusion – JFK’s face was photographically pasted on someone else’s body. It was very well done – it had to be, as it was meant to fool a lot of people for decades to come. However, they neglected to make sure that the ears aligned, probably not anticipating a program like Photoshop. Now that we know what to look for, we can indeed see the signs of where the paste-up was done. On this photo, we can see a shadowed area resembling a line about an inch wide that begins under the chin and works its way up to the left eye. Above it is JFK, below it someone else. It does not include the ear, their fatal flaw (pardon the expression). On this photo we have a part of the face slightly overexposed that includes chin, mouth, nose and eyes – JFK indeed did have a very weak right eyebrow. We can see a change in texture under the chin – that would be the bottom part of the paste-up. We can also see age wrinkles below the right eye – that too is a demarcation, as I see it. The researcher also goes on to describe the morgue body as too young and too athletically fit to be Kennedy’s, reminding us that he wore a back brace and was in constant pain, and so probably did no exercise. In fact, he came to the correct conclusion – the guy is not Kennedy, and he is not dead. He is just wearing a borrowed face. The misplaced ear, if I may be so bold, is … ahem … proof … that the body in the morgue is not JFK. It is therefore safe to conclude that he earlier posed for photos that were later pasted on another body. There would be no other reason – if he had really died, no paste-up would be needed. All photos, real and fake, shock us, so that saying they did not want us to see the real corpse makes no sense. The only question unanswered is why JFK simply did not pose for the photos so that a paste-up was not needed. I don’t know, of course, but I would guess he thought it undignified to be seen undressed in public. And that, to me, is proof of life after death. JFK faked his death on 11/22/63, and please note, numerology people, that 11 + 22 = 33. PS: In answer to the question of whose ear we are looking at, it appears to me that the ears agree in shape and size on the side view photo, so that a separate paste-up of the ear was done over the original. However, they had to place it in the same position as the ear on the fake body, out of line with the real JFK. Update: Below are the morgue photo from above, and another with a red line showing where they pasted JFK’s face into the photo. If you look long enough, it will become clear to you. Great detective work, Mark. The facial overlay with misaligned ears seals the deal. I finally learned how to do a layer with PS! It has taken a long, long time to learn a simple procedure. Adding to the numerology with JFK’s supposed death of 11/22/63 with 11+22= 33 is 6+3=9 which is 3^3 or 33. So you get dual 33s. The Sovereign Grandmaster wears the 33s in Freemasonry. i read that tippet was the spitting emage when younger. im thinking that they had intended to use tippet as kennedy,but chaged their mind. this would answer the question why the shooter would bend down and give tippet a head shot after he was dead. mark i agree with you on the deley plaza being filmed on different days. there has always been questions why that for the whole route,there were people linning the street 4 to 6 deep to get a look at the president.then when they turned the corner only 50 or more people in single file. and the didnt look in the direction of the car..and none waved. so this had to be prefilmed and spliced in. Love the mention of the finger to the right temple as an indication of lying- I’ve been keen to refine my skills at spotting such deception- Do you have any recommendations as to literature on the subject? If it tells you right at the beginning that when a woman smiles but does not expose her teeth, that she is just enduring you but not interested, it is the one. Was the same ear used in both photos? If not, the fake corpse has a very similar ear. The ear is, I believe, JFK’s ear on the side view. It was superimposed over the original ear, but not moved, which is why it is in a different location on the layered comparison. On the view where we are looking down on him, I don’t think that is JFK’s ear. It is too square at the top. Thanks, that explains the similarity between the ears in the side views despite their locations being different. You are right, the ear in the top down view is square on the top and doesn’t appear to be the same as those shown in the side views. The fact that the Zapruder film shows JFK’s right temple exploding while the morgue photos show no such thing kind of wraps up the assassination as a fake for me. If you haven’t done so already, take a look at the Mathis Paper, which also covers RFK and Chappaquiddick and JFK Jr. and much more, and also Tyrone’s JFKTV, which is linked here and there – don’t have it handy right now. Everything was fake, and news media was complicit from the beginning. Yes, I’ve seen the Mathis paper and it is very good. I’ve also posted analysis of the “Oswald shooting” but I’m not sure where at this moment. That one was a REAL joke! Great work there, Lux! The connection to the OJ trial and Wayne Carver at the end of that thread was especially eye-opening. I need to go back and read the entire thread. I stopped with the RFK analysis. Great post, Mark. This is on par with MM’s paper and Tyrone’s paper as one of the best investigative strokes of the JFK event. Real landmark stuff here. Wow. Thank you. Honestly, and you know this feeling too, this has been an exciting mission. These things are not well hidden, just accepted and never examined. You could be right, but I see a faint change in skin texture that heads down towards the ear. But we are in agreement that the face is superimposed on another skull. It was very well done. Also note that the hair looks like a Moe Howard (Three Stooges) wig slapped on top of the real hair. I am still suspicious that Officer Tippet was used here, but Tyrone says no, everyone lived. Maybe they used a living Tippet due to similarities in the skull? He was known to have looked a lot like JFK, though I don’t see it in the few photos that exist of him. I was just looking over this post again and noticed the obvious “toupee” on top of his head…it escaped me previously. I think you are right. I see it clearly now. Thanks. I really like how you give an ‘over the shoulder’ perspective, where the reader gets an inside look at your own thought process, as you carefully dissect this one crucial detail. It’s very persuasive and timely. This surely can win people over to a new way of thinking and inspire them to dig further. It’s interesting how even after a good deal of reading and looking at these analyses of fakery, I still have to go through a kind of third-grade thought process, repeatedly managing the layers of information one step at a time. It’s like it doesn’t gestalt very well and I can’t easily see it as a whole thing. Maybe because the brain isn’t wired for perceiving this kind of trickery, or maybe because it’s layers of fakery and each of them gets the mind going in other directions, like the five W’s. You’ve really made this subject very accessible. The mind is undoubtedly wired for proof. Gratzi. It’s pretty stylish too, in the sense that so many people like forensic shows like Bones. I don’t know if you’re anticipating increased readership but this one ought to put an arc in your fishing pole if you are. I’ll be passing it around for sure. Hopefully it’ll help convince my wife, who doesn’t have the patience to plow through 80 page pdf’s like I do. All it might take for her is one master-stroke and this could be it. Miles told me many months ago that I had the habit of looking at things with assumptions in tow. We were working McCartney at the time, my first time in the deep end of the pool. It’s like the Zapruder film where none of us ever questioned who was in the limousine or why Abraham stood so far back when he could have been right on the curb. All we needed to do was stop assuming and ask different questions. I agreed with you about Mile’s longer works. I’ve always pointed to his Tate/Manson write-up as my favorite. His JFK paper is very good, as well… although I’ve always been a bit uncomfortable by his “hidden kings” argument. Miles has mentioned many times that the office of President has been just a front for many years. Why the assumption that the Kennedys are running things from behind the scenes, and not just retiring like all the other fake deaths? I, too, find his genealogy work to be a much more challenging read. He clearly has an amazing memory, and it’s truly fascinating (and important) to see his research all come together into a proof that all these families are connected, and have been for centuries. Frankly, it would take me way more time than I have, to take all his links, and confirm all his genealogy findings/connections. I trust Miles, so I find myself just taking his findings on faith. It’s much different than his photo analysis, obviously, where we can immediately decide for ourselves if Miles is on the right track. I really enjoyed his election day paper, mainly because it was more of a throwback to some of his older rants. Hi Brandon – My wife just yesterday asked, rhetorically because none of us know, how do they make decisions? I suggested to her that this was why Miles came up with the idea of hidden kings and ruling councils. Decisions have to be made. There has to be structure. I agree that it’s highly speculative, and he would no doubt agree. But with all of these fake dead Kennedy’s, Joe, Kathleen, John, Robert, John Jr., I think it is a good guess. Anyway, I have tried to graph Miles’ recent papers, and gave it up. He goes in so many directions, it’s like throwing spaghetti at the wall and calling it a road map. But it is important work and I am glad he is doing it. There is no way I could make all the connections he does with his superb memory. Terrific, and great team work. I read that book twice back in the 80’s. The one thing that didn’t make sense to me then and with what we know now is laughable, is them being able to perform some kind of surgery that quickly that would be able to fool an autopsy. Just shows how easy we are to fool when you have a preconceived notion in mind. Just shows how easy we are to fool when you have a preconceived notion in mind. Note the big fake nose that is lighter in color than the rest of the face. And, why would they need to do an autopsy on a man who was supposedly shot to death on camera and died in a hospital? Wow, never seen that before. I wish I could read the words on the sheet, as it looks like a real cadaver. If we know that Oswald did not die, then we know this is a fake photo, the lighting just the beginning. I’ll bet you can tear it apart with ease. Have at it! I’m a little used up on this stuff. Autopsies are usually required by law in violent deaths. They answer more questions than did he die, such as who he was, how many shots, other wounds, what direction, all of that. They are too important to be left to honest people. The corrupted coroner’s office was really important in faking RFKs death, John Denver’s and so many others. The unnaturally illuminated part of the face could be a paste-up of “Harvey,” the Oswald twin that was arrested in Dallas. He had heavy eyebrows like that. The rest bears a vague resmemblance, though the nose does at first glance seem large. Someone needs to compare ears, facial measurements, all of that, to ascertain what fresh monkey business is afoot here.